Our joiners will manufacture your joinery and also undertake the fitting of it. Occasionally, we may need to arrange for another trusted joiner to fit the joinery for us, in the event we are extremely busy. Our typical fitting service consists of the following steps. We will arrange a mutually convenient fitting date with you and will always try to give as much notice as possible. Ideally, access to the area of work should be cleared prior to our arrival. Curtains, blinds ect. should be removed in preparation. Burglar alarm contacts and door bells should also be disconnected by your alarm company or a qualified electrician beforehand. Ample protective coverings for your flooring , furniture, ect. will be supplied and used. Every care will be taken to avoid any damage to your property. All the existing old joinery will be removed in a careful and safe manner, taking care of the surrounding area. The site will always be left tidy, safe and secure at the end of each day. Your new joinery will then be offered up to your home. Using appropriate fixings for the buildings construction ,we will securely fix the joinery frames in place. Filling any voids around the frames, and sealing the perimeters appropriately will ensure a weather tight finish. 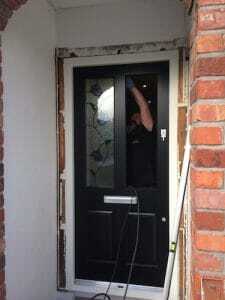 Doors and casements will then be fitted, so that the property is safe and secure. In some situations this may be as far as we get in a day. Although there may still some trimming out to be done, we may leave that for the next day. This means the job is not rushed, and leaves us enough time to tidy and secure the area. We take great pride in being clean and tidy. As a matter of course, we vacuum during installation and upon completion and leave the area in an immaculate order. Although every effort will be made to keep any plaster damage to a minimum, there may indeed be damage that will need to be made good again. Often the this can be overlooked by other contractors. It can seriously detract from the finished product and in fact leave your home or product vulnerable. We pride ourselves on finishing everything to the utmost standard. This will always ensure that there are no unsightly snags when we leave your property. We can discuss a range of different options for trimming out and the making good of the job, both internally and externally. On older properties, it may not be possible to pre-empt what trims will be required. Therefore these may need to be manufactured after completing the main body of your fitting. On completion, we will invite you to inspect our work in order to ensure you are happy with the results and that we have met your expectations. A detailed explanation of the locking systems and operation of same will be given, ensuring you are entirely confident with their operation. Advise and tips on the upkeep and maintenance of your new joinery and supplied furniture can be discussed. We want you to be delighted with the finish and quality of our service. Confident that you would be happy to recommend us in the future.